Hundreds of shoppers in our community will misspend thousands of dollars at major local retailers buying inefficient heating products partly due to deceptive advertising and unsubstantiated claims. The following list of dubious claims was collected in about 20 minutes: 10 minutes walking around the heating department of a large store, and 10 minutes leafing through circulars that appeared in my letterbox last Saturday morning. All of these claims apply to what is basically the same product: a plug-in electric heater. 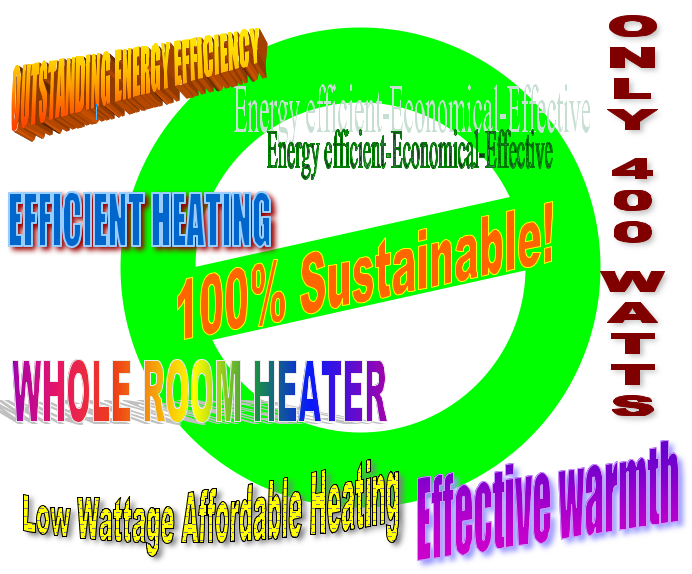 ECO; EFFICIENT HEATING; “Real warmth, real savings”; “High Efficiency Heating”; “LOW WATTAGE Affordable heating”; “Effective warmth”; “Energy efficient – Economical – Effective”; “Save up to 50% or more on your heating costs”; “ONLY 400 WATTS”; “WHOLE ROOM HEATER”; “OUTSTANDING ENERGY EFFICIENCY”. Let’s take a standard 2-kilowatt (2,000 watt) heater as our baseline for this discussion. Over the course of one hour this heater will use 2 ‘units’ of power (costing 50-60 cents) to produce to ‘units’ of heat. Got the physics? Now, on to the language. Efficiency is recognized as the ability to reduce waste, save effort or energy, or generally to accomplish more by using less. For example, an energy efficient light bulb produces the same amount of light while using less power. Similarly, a fuel-efficient vehicle travels 100 km on fewer litres of petrol than an inefficient vehicle. In most cases, efficiency is a matter of relativity. In other words, one thing is seen as efficient relative to something else that is inefficient. Here is the kicker for today’s discussion: all plug-in electric heaters are considered inefficient when compared with heat pumps, wood burners, and flued mains gas heaters. By comparison, heat pumps have an efficiency of 1:3 or 1:4. This means that for one unit of power they produce three or four units of heat. From this perspective, the claims above appear completely out of line. Let’s start with the last one: “OUTSTANDING ENERGY EFFICIENCY.” Shocking claim. I suggest this squarely falls into the category of false advertising. Sadly, it probably works brilliantly and has resulted in many sales to well meaning and unsuspecting pensioners and parents of young children. Next up: “ONLY 400 WATTS.” This gets to the heart of the e/eco/econo/ecocalifragilisticexpialidocious claims on certain plug-in electric heaters. They are small and give off little heat. When compared to a 2,000 watt plug-in heater, a 400 watt heater uses 1/5 the power and generates 1/5 the heat. In both cases the efficiency ratio is 1:1. Imagine you pull into a petrol station and the offer of the day is 1/5 tank of petrol for only 1/5 the price of a full tank. Is that a bargain worth spelling out IN ALL CAPS? Which brings us to another claim: “Save up to 50% or more on your heating costs.” According to my calculations, if you replace every 2,000-watt heater in your home with a 400-watt heater you will save exactly 80% on your heating costs because you will live in a very cold home. No wonder the package of one product claims: “LOW WATTAGE Affordable heating.” True, but certainly misleading. I could go on all day but it appears I’ve run out of words, so I’ll leave you with this: “WHOLE ROOM HEATER.” Absolutely true for a VERY SMALL ROOM or a VERY WARM DAY. Once again the lesson is to be very cautious of all claims on how to make your home warmer and drier. Seek independent expert advice from the EECA Energywise website (www.energywise.govt.nz) or the Eco Design Advisors website (www.ecodesignadvisor.org.nz).